The eco-watt is a wattmeter on the market easily though the wattmeter is usually used for the measurement of power consumption. If the electric power of the product with small power factor is measured, the eco-watt grows the error margin and doesn't become something useful. Then, because watt checker (2000MS1) of the instrumentation technology laboratory that was able to measure power factor had been obtained, the performance was easily measured. The result was able to measure accurately even if power factor was bad (Even if it was small), and was a performance more than the price. This photograph is the one that M-3860M of left METEX was made a wattmeter, and the one when power consumption etc. are measured by using watt checker (2000MS1) at the same time. There is an insertion plug part on the other side of the watt checkered main body, and is an outlet of the equipment measured in the upper part of the main body. The button can be measured at once in ..pushing.. [dakede] by inserting it in these outlets. The measurement items are eight items (voltage (V), current (A), active power (W), apparent power (VA), frequency (Hz), power factor (PF), integral power consumption (kWH), and adjusting time (H)). There seems to be the one of the product number named TAP-TST5 though the product obtained this time was 2000MS1, too. I think that contents are maybe the same. The basic performance is the same recently though there is the one that multiplication charge named TAP-TST7 and CO2 conversion (kg) can be displayed, too. The power factor of National fan (F-A302C) experimented on the measured equipment to the septic tank air pump of the load of the one and L character of almost one (National CL2329A) and this septic tank air pump as follows by the one of the load of C character that connected the capacitor of 18μF with the series and the one that the capacitor of 10μF200VAC of C character was completely assumed to be a load. The value as which both of the result of a measurement were almost the same was indicated. The current became 0A why and M-3860M of METEX was not able to be measured for the load only of the capacitor. Measurements without parentheses are the one of watt checker (2000MS1). Measurements in parentheses are the one of M-3860M of METEX. Any M-3860M of METEX can be measured by voltage (V), current (A), power factor (PF), and active power's (W) being displayed at the same time even if it doesn't do. It easily explains R, L that adds the capacitor to the series, and the concept of the impedance of C series circuit in the septic tank air pump (National CL2329A). An electric circuit of the air pump of diaphragm type's septic tank can be considered that resistance that the inductance of the coil is the main and is small is in the series. To connect the capacitor of small capacity (large reactance) with the series and to decrease power consumption to this, it planned. 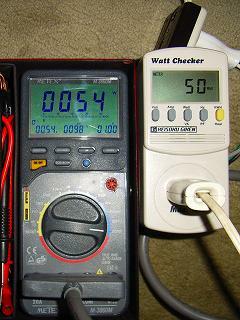 This watt checker is a standard price of about 10,000 yen, was sold at 5000 yen. I think for the price very good product performance. Eco watts compared to the difference in performance is obvious. I think it is the best for the check on the power consumption of home appliance, the measurement of the multiplication electric power, and the measurement of the standby power requirement. However, I do not think that I project on the back side of the main body the plug, and use it easily a little. The plug can be stored or the plug with a short code is smarter.